Augsburg's Campus Kitchen program was recently honored by the Association of Fundraising Professionals with the Outstanding Youth Award for 2009 at National Philanthropy Day in Minneapolis. Augsburg students were recognized that serves more than 1,700 meals each month to low-income and homeless persons and communities in need in the Cedar-Riverside and Phillips neighborhoods. 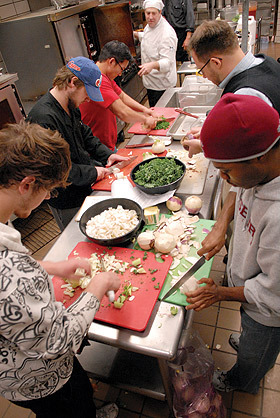 The Campus Kitchen at Augsburg College was established in October 2003 and is one of only 15 Campus Kitchen organizations around the country. The program, which is largely run by Augsburg students, brings together the college dining service, local community groups, and individuals to plan, prepare, deliver, and serve meals. Under the direction of staff coordinator Brian Noy and two student interns, a student leadership team coordinates other volunteers for three cooking shifts and six food deliveries each week. Meals are prepared, stored overnight, and delivered the following day. The students also give of their heart, providing conversation and offering companionship to the individuals they serve. A'viands food service—From their arrival at Augsburg in June 2009, A'viands has embraced Campus Kitchen and provides access to unused food. Donations also come from community food banks and other institutions. Community Supported Agriculture (CSA)—Campus Kitchen is the site coordinator for all Augsburg CSA shares and receives six shares through Ploughshare Farm's Food for Folk Project. Community garden—Over three years, Augsburg's community garden has provided space for neighborhood residents, Augsburg employees, and community organizations to grow their own food. Summer Garden and Nutrition Education Project—Augsburg students teach neighborhood youth from the Brian Coyle Community Center and the Somali Confederation about health, nutrition, gardening skills, and cooking nutritious meals. West Bank Farmers Market—In partnership with the Coyle Center, local farmers sell their produce once a week during the summer and fall at Augsburg. The farmers often donate unsold food to Campus Kitchen. Service-learning—Augsburg students get hands-on learning about how resources are collected, distributed, and controlled in the "living text" of Campus Kitchen. In its six years, Campus Kitchen has been the recipient of three awards recognizing the program's outstanding service and achievements: Student Organization of the Year, given by Augsburg College; Harry Chapin Self-Reliance Award, given by World Hunger Year in 2004; and the Great Idea Award, given by America's Promise. Read more about Campus Kitchen.